28S-FAR-113 this is a “28Standard” 4Ground model with high detail and pre-painted parts. Many towns and almost all the cities of the Teuden League are walled, with Mordanburg having a fine example, not only around its great and beautifully “Fortification” citadel of Anburg but also on the opposite bank of the Langa River around the landward side of that rather stinky sprawling part of Mordanburg still locally known as the old port of ‘Mordavig’. It is usual for cities to be divided within their walls into dozens of wards, each with their own watchtower, manned by a fine body of wardens. In those parts of the fabled realms where ‘winged worms’ fly freely across the skies, it is not uncommon to see hefty ‘Dragon Bane’ catapult mounted a top of watchtowers and the walls of a city, from where, with good views, a loosed dragon lance will better find its mark. As well as its wardens (professional garrison/watchmen) each ward can raise from its common folk its own militia, known in many cities as the ‘stand’ or the ‘steadfast’. In times of need, it is to their watchtower that local folk of the stand rally. 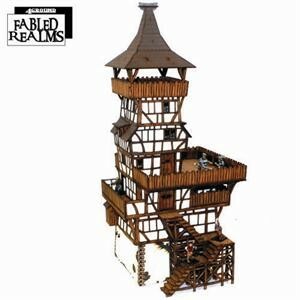 Once equipped with pole-arms, crossbows and alike from their watchtower’s armoury, most of the stand will accompany many of their wardens directly to the walls, but a few will be left behind to hold secure the watchtower, and there, with those few key wardens that remain, they will keep order within the streets and allies of their ward during such times of unrest. Each ward has its watchtower and likewise each watchtower has its Wardmaster whose task it is to govern that ward. With his powers of office invariably emanating from within the watchtower of his ward, the master has many responsibilities; to promote trade and industry, to collect taxes and revenues, and of most paramount, to keep good order. In so doing he has a call of duty within his ward to distil and administer local justice in the name and the stead of the city’s aldermen. The original common populous of Mordavig were of lowly sea pirate stock and to this base type have come generations of cut throats and footloose adventurers. It is therefore of no great surprise to find that most city watchtowers within Mordavig have what could best be described as suitable and visibly apparent deterrents to those who need reminding of their civic responsibilities. These cover a broad spectrum of deterrents, from being chained to a set of humbling rings below the poop-deck opening of the watchtower’s ‘Garderobe’, to being incarcerated at the master’s pleasure within the gaol cells at the base of his tower. If ever more is needed, there is often to be found in some corner of the gaol a corrective ‘Oubliette’, where at least they can be out of sight of the master and, if they live through this education, eventually out of their mind they are able to rejoin their fellows of the local ward, when left of such little wits they no longer retain a problematic disposition.